What does sustainable forestry mean to you? That is the question we asked concert goers in downtown Portland last week. The nonprofit organization Ecotrust hosted the music and invited groups to attend with educational booths related to the theme “Treasuring Forests.” At the OSU Extension table, we talked to members of the crowd about the Hopkins Demonstration Forest, the Women Owning Woodlands Network, and the important role that the 70,000 Oregon family forest owners play in our state. 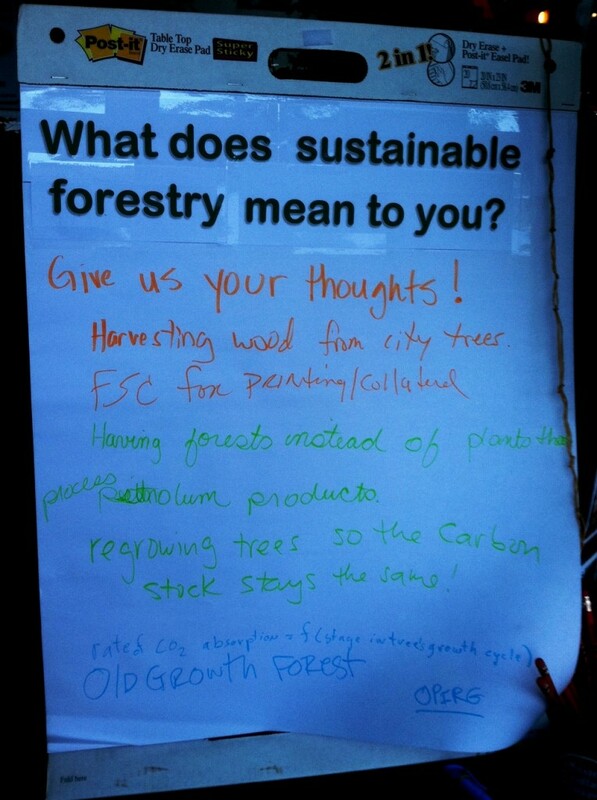 As a conversation starter, we put up a flipchart and invited people to give us their definition of sustainable forestry. A few brave souls took on the challenge. This led to some interesting interactions. My own view is that sustainable forestry is a much larger and more nuanced concept than anything captured on the flipchart. But I think it’s always instructive to hear what non-forest owners perceive and understand about forestry. So, what does sustainable forestry mean to you? And, more importantly, two follow up questions: Are you able to implement your vision of sustainable forestry on your land? If not, what is standing in the way? I invite you to write your thoughts on the virtual flipchart, a.k.a. the comments section of this post. Join the Oregon Women Owning Woodland Network on Saturday, January 21st for a program on “How to Interpret Your Timber Cruise“. Learn how to understand what a cruise report tells you about your timber, when is the right time to have a cruise done, and options for updating an old one. If you have a cruise report from your own property, bring it along to work with.